The MuffWiggler Store is open for business. 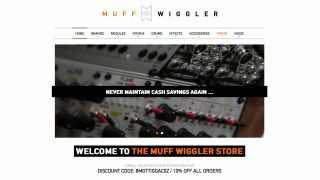 PRESS RELEASE: The MuffWiggler Store is a new retail and online shop in Portland, Oregon, specializing in modular synths and instruments for electronic music. MuffWiggler supports the entire Modular Synth Community as its primary goal, bringing the synth community to life by hosting its growing forums, organizing and sponsoring events, artists, and workshops. With a carefully curated selection of Vinyl, and Artist/Event Showcases MuffWiggler will be your one source for everything Modular Synth. Featuring a varied showroom of new and used Synthesizers, Modular (Eurorack, Buchla and 5u) systems, Effects, Records and Accessories. MuffWiggler stocks many hard-to-get International and Domestic products as well as regional and Portland-made merchandise. Supporting The Grand Opening Sale is 1O% off of all products Thursday April 3 through Sunday midnight April 6, and a free MuffWiggler t-shirt with purchases of $15O or more while supplies last! As always, no sales tax and free US shipping!